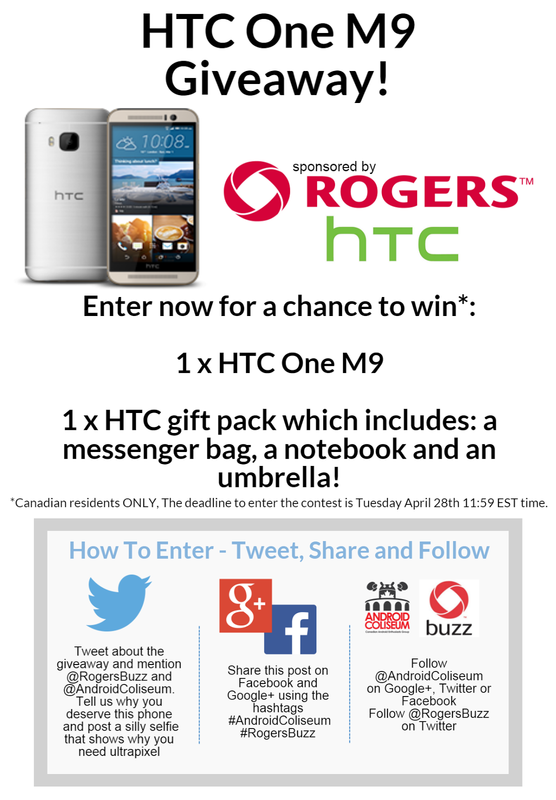 Contest Giveaway htc One M9 Rogers Enter our HTC One M9 Giveaway! Enter our HTC One M9 Giveaway! Make sure to enter our HTC One M9 Giveaway! First prize: HTC One M9 sponsored by Rogers. Second Prize: Messenger bag, Notebook and an Umbrella from HTC. Your tweet will need to tell us why you deserve this phone. Then don't forget to add a silly selfie of your none UltraPixel camera. Share the giveaway on Facebook or Google+ using the #AndroidColiseum #RogersBuzz hashtags. All this counts for 1 entry per person. Make sure you follow the rules! We always hate having to remove people from the contest! Let us know what you think of the HTC One M9! We're always looking to hear from our readers, viewers and listeners! The deadline to enter the contest is Tuesday April 28th 11:59 EST time. Again a big thank you to our sponsors Rogers & HTC.